JOURNAL PAPERS PUBLISHED BY GÁBOR LUGOSI. L. Addario-Berry, L. Devroye, G. Lugosi, and R. Imbuzeiro Oliveira. Local optima of the Sherrington-Kirkpatrick Hamiltonian. G. Lugosi and S. Mendelson. Near-optimal mean estimators with respect to general norms. G. Lugosi and Alan S. Pereira. Finding the seed of uniform attachment trees. G. Lugosi, and S. Mendelson. Sub-Gaussian estimators of the mean of a random vector. M. Barigozzi, C. Brownlees, and G. Lugosi. Power-law partial correlation network models. L. Devroye, L. Györfi, G. Lugosi, and H. Walk. A nearest neighbor estimate of the residual variance. Regularization, sparse recovery, and median-of-means tournaments. E. Arias-Castro, S. Bubeck, G. Lugosi, and N. Verzelen. Detecting Markov random fields hidden in white noise. Risk minimization by median-of-means tournaments. E. Arias-Castro, G. Lugosi, and N. Verzelen. Detecting a path of correlations in a network. E. Joly, G. Lugosi, and R. I. Oliveira. On the estimation of the mean of a random vector. S. Bubeck, L. Devroye, and G. Lugosi. Finding Adam in random growing trees. L. Devroye, M. Lerasle, G. Lugosi, and R. Imbuzeiro Oliveira. A. Cholaquidis, R. Fraiman, G. Lugosi, and B. Pateiro-López. Set estimation from reflected Brownian motion. E. Joly, and G. Lugosi. N. Broutin, L. Devroye, and G. Lugosi. Almost optimal sparsification of random geometric graphs. L. Addario-Berry, S. Bhamidi, S. Bubeck, L. Devroye, G. Lugosi, and R. Imbuzeiro Oliveira. Exceptional rotations of random graphs: a VC theory. C. Brownlees, E. Joly, and G. Lugosi. Empirical risk minimization for heavy-tailed losses. L. Devroye, G. Lugosi, G. Neu. Random-walk perturbations for online combinatorial optimization. E. Arias-Castro, S. Bubeck, and G. Lugosi. Detecting positive correlations in a multivariate sample. R.M. Castro, G. Lugosi, P.-A. Savalle. Detection of correlations with adaptive sensing. J.Y. Audibert, S. Bubeck, and G. Lugosi. Regret in online combinatorial optimization. P. Delicado, A. Hernández, and G. Lugosi. Data-based decision rules about the convexity of the support of a distribution. N. Broutin, L. Devroye, N. Fraiman, and G. Lugosi. Connectivity threshold of Bluetooth graphs. S. Bubeck, N. Cesa-Bianchi, and G. Lugosi. A. György, T. Linder, and G. Lugosi. N. Cesa-Bianchi and G. Lugosi. A previous version was presented at COLT 2009. I. Benjamini, S. Boucheron, G. Lugosi, and R. Rossignol. Sharp threshold for percolation on expanders. L. Devroye, A. György, G. Lugosi, and F. Udina. High-dimensional random geometric graphs and their clique number. L. Addario-Berry, N. Broutin, L. Devroye, and G. Lugosi. Comment on: l1-penalization for mixture regression models. L. Addario-Berry, N. Broutin, and G. Lugosi. The longest minimum-weight path in a complete graph. A. György, G. Lugosi, and Gy. Ottucsák. S. Boucheron, G. Lugosi, and P. Massart. On concentration of self-bounding functions. Effective resistance of random trees. L. Devroye, G. Lugosi, and G. Park, and W. Szpankowski. G. Lugosi, S. Mannor, and G. Stoltz . Strategies for prediction under imperfect monitoring. G. Biau, L. Devroye, and G. Lugosi. Consistency of random forests and other averaging classifiers. S. Clémençon, G. Lugosi, and N. Vayatis. Ranking and empirical minimization of U-statistics. An earlier version appeared at COLT 2005 (PDF, PS). 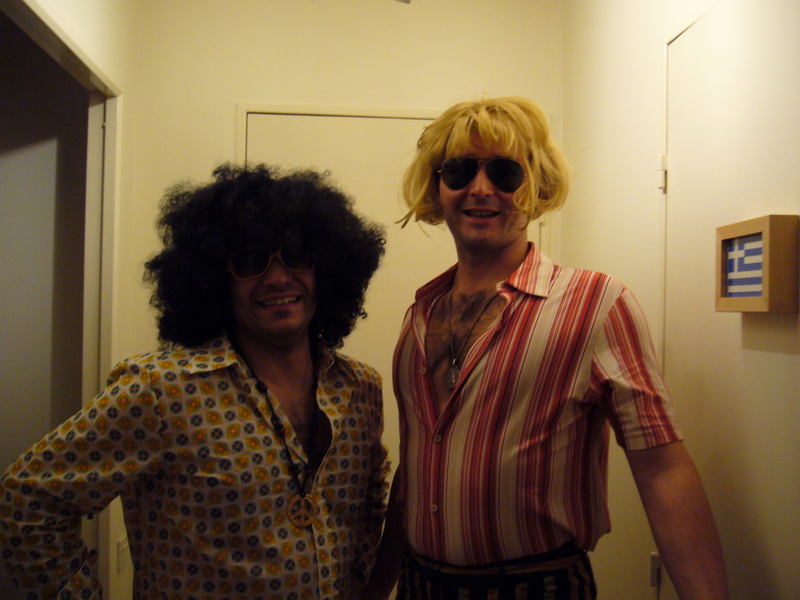 My coauthors in 1974 just before the casting of a John Holmes movie. L. Devroye and G. Lugosi. Local tail bounds for functions of independent random variables. G. Biau, L. Devroye and G. Lugosi. On the performance of clustering in Hilbert spaces. A. György, T. Linder, G. Lugosi, and Gy. Ottucsák. The on-line shortest path problem under partial monitoring. F. Germano and G. Lugosi. Global Nash convergence of Foster and Young's regret testing. Existence of sparsely supported correlated equilibria. G. Stoltz and G. Lugosi. Learning correlated equilibria in games with compact sets of strategies. Prédiction randomisée de suites individuelles. S. Clemençon, G. Lugosi, and N. Vayatis. Some comments on "Local Rademacher complexities and oracle inequalities in risk minimization" by Vladimir Koltchinskii. N. Cesa-Bianchi, G. Lugosi, and G. Stoltz . Regret minimization under partial monitoring. L. Györfi, G. Lugosi, and F. Udina. Nonparametric kernel-based sequential investment strategies. S. Boucheron, O. Bousquet, and G. Lugosi. Theory of Classification: a Survey of Recent Advances. R. Cao and G. Lugosi. Goodness-of-fit tests based on the kernel density estimate. Minimizing regret with label efficient prediction. S. Boucheron, O. Bousquet, G. Lugosi, and P. Massart. Moment inequalities for functions of independent random variables. "Internal regret in on-line portfolio selection." "Efficient Algorithms and Minimax Bounds for Zero-Delay Lossy Source Coding." "Bin width selection in multivariate histograms by the combinatorial method." G. Lugosi and M. Wegkamp. "Complexity regularization via localized random penalties." G. Lugosi and N. Vayatis. "On the Bayes-risk consistency of regularized boosting methods." Annals of Statistics, vol.32, pp.30--55, 2004. (PDF,POSTSCRIPT) with discussion. G. Lugosi, S. Mendelson, and V. Koltchinskii. "A note on the richness of convex hulls of VC classes." G. Blanchard, G. Lugosi, and N. Vayatis. "On the rate of convergence of regularized boosting classifiers." "Concentration inequalities using the entropy method." "Potential-based algorithms in on-line prediction and game theory." Machine Learning, vol.51, pp. 239--261, 2003. A. Antos, B. Kégl, T. Linder and G. Lugosi. "Data-dependent margin-based generalization bounds for classification." "Almost sure classification of densities." L. Devroye, L. Györfi, and G. Lugosi. "A note on robust hypothesis testing." IEEE Transactions on Information Theory, , vol. 48, pp.2111--2114, 2002. P. Bartlett, S. Boucheron, and G. Lugosi. "Model selection and error estimation." Machine Learning. vol.48, pp. 85-113, 2002. T. Linder and G. Lugosi. "A Zero-Delay Sequential Scheme for Lossy Coding of Individual Sequences". IEEE Transactions on Information Theory, , 47:2533--2538, 2001. L. Györfi, and G. Lugosi. "Strategies for sequential prediction of stationary time series". in Moshe Dror, Pierre L'Ecuyer, Ferenc Szidarovszky (editors), Modeling Uncertainty:An examination of its theory, methods, and applications., Kluwer Academic Publishers, 2001. "Worst-case bounds for the logarithmic loss of predictors." Machine Learning vol.43(3). pp.247--264, 2001. "A sharp concentration inequality with applications." Random Structures and Algorithms vol.16, pp.277-292, 2000. S. Kulkarni and G. Lugosi. "Minimax lower bounds for the two-armed bandit problem." IEEE Transactions on Automatic Control. vol.45, pp.711-714, 2000. L. Devroye, G. Lugosi, and F. Udina. "Inequalities for a new data-based method for selecting nonparametric density estimates"
in M.L. Puri (editor), Asymptotics in Statistics and Probability. Papers in Honor of George Gregory Roussas., VSP International Science Publishers, The Netherlands, 2000. "Variable kernel estimates: on the impossibility of tuning the parameters." in: E. Giné, D. Mason, and J. Wellner (editors), High-Dimensional Probability II, Springer-Verlag, New York, 2000. "On prediction of individual sequences." Annals of Statistics vol. 27, 1865--1895, 1999. G. Lugosi and A. Nobel. "Adaptive Model Selection Using Empirical Complexities." Annals of Statistics vol. 27(6), 1830-1864, 1999. L. Györfi, G. Lugosi and G. Morvai. "A simple randomized algorithm for consistent sequential prediction of ergodic time series"
IEEE Transactions on Information Theory, vol.45, 2642--2650, 1999. P. Bartlett and G. Lugosi. "An inequality for uniform deviations of sample averages from their means"
Statistics and Probability Letters, vol.44, 55--62, 1999. S. Kulkarni, G. Lugosi, and S. Venkatesh. IEEE Transactions on Information Theory. , vol.44, 2178--2206. Reprinted in S. Verdú, S.W. McLaughlin (editors. ), Information Theory: 50 Years of Discovery, IEEE Press, New York, 1999. "Strong minimax lower bounds for learning,"
Machine Learning, vol.30, 31--56, 1998. P. Bartlett, T. Linder, and G. Lugosi. The minimax distortion redundancy in empirical quantizer design. IEEE Transactions on Information Theory. , vol. 44, 1802--1813, 1998. "A data-dependent skeleton estimate and a scale-sensitive dimension for classification." Discrete Applied Mathematics, Special issue on the Vapnik-Chervonenkis dimension. vol. 86, no. 1, pp. 37-61, 1998. "Nonasymptotic smoothing factors, kernel complexity, and Yatracos classes." Annals of Statistics , vol. 25.,2626--2635, 1997. Comments to "Universal smoothing factor selection in density estimation: theory and practice" by Luc Devroye. Test, vol. 6, pp. 291--296, 1997. T. Linder, G. Lugosi, and K. Zeger. IEEE Transactions on Information Theory. , vol. 43, no. 2, pp. 612--623, March, 1997. "A universally acceptable smoothing factor for kernel density estimates,"
Annals of Statistics , vol.24, pp.2499--2512, 1996. "Concept learning using complexity regularization,"
IEEE Transactions on Information Theory. , vol.42, No.1, pp.48--54, 1996. "Consistency of data-driven histogram methods for density estimation and classification,"
A. Krzyzak, T. Linder, and G. Lugosi. "Nonparametric Estimation and Classification using Radial Basis Function Nets and Empirical Risk Minimization,"
IEEE Transactions on Neural Networks, vol. 7, pp.475--487, 1996. "Lower bounds in pattern recognition and learning,"
Pattern Recognition, vol.28, No.7, pp.1011--1018, 1995. "Improved upper bounds for probabilities of uniform deviations,"
Statistics and Probability Letters, vol.25, pp.71--77, 1995. "Nonparametric estimation via empirical risk minimization,"
IEEE Transactions on Information Theory. , vol.41, No.3, pp.677--687, 1995. T. Linder, T. Lugosi, and K. Zeger. IEEE Transactions on Information Theory. , vol. 41, no. 3, pp. 665-676, 1995. J. Beirlant, L. Györfi, G. Lugosi. "On the asymptotic normality of the L_1- and L_2-errors in histogram density estimation,"
Canadian Journal of Statistics, vol.22, No.3, pp.309--318, 1994. L. Devroye, L. Györfi, A. Krzyzak, G. Lugosi. "On the strong universal consistency of nearest neighbor regression function estimates,"
Annals of Statistics , vol.22, No.3, pp.1371--1385, 1994. "On the posterior-probability estimate of the error rate of nonparametric classification rules,"
IEEE Transactions on Information Theory. , vol.40, No.3, pp.475--481, 1994. Journal on Communications (Hungary), vol. XLV, pp. 16-22, 1994. A. Faragó, T. Linder, and G. Lugosi. "Fast nearest neighbor search in dissimilarity spaces"
"Strong universal consistency of neural network classifiers,"
IEEE Transactions on Information Theory. , vol.39, No.4, pp.1146--1151, 1993. "Learning with an unreliable teacher,"
"Kernel density estimation from ergodic sample is not universally consistent,"
Computational Statistics and Data Analysis, vol.14, pp.437-442, 1992. "Pattern classification from distorted sample,"
Problems of Control and Information Theory vol.20, No.6, pp.465-473, 1991. A. Faragó, T. Linder and G. Lugosi. "Nearest neighbor search and classification in O(1) time,"
Problems of Control and Information Theory pp. 475-482, vol. 20. no 6, 1991. "An algorithm to find the global opimum of hidden Markov model parameters,"